Hillary Clinton's presidential campaign chair John Podesta was warned by journalist Brent Budowsky that 'a cycle of money issues' could bring down the Democratic nominee and the party, a leaked email published by WikiLeaks has revealed. In email leak 6900 the columnist for The Hill writes: "It was not uplifting to learn in recent hours that problems with foreign donations to the Clinton Foundation continue, Hillary Clinton was still making paid speeches for hire this week, and Tony Rodham is hustling gold mining deals in Haiti." The email is dated March 21, 2015 and carries the subject line 'Hillary Clinton warning'. Mr Budowsky continues: "If there is one thing that could well bring down a Hillary Clinton candidacy it is this cycle of money issues about which I am now feeling red alerts, loud bells, warning signals, and red flags. 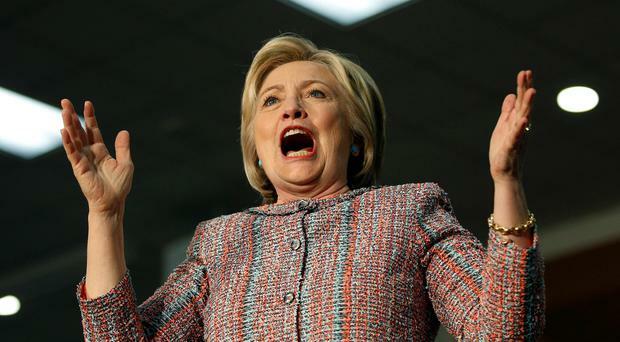 "I am now seriously pi**ed off that there is a real chance that her candidacy and the Democratic Party could be destroyed by these self-created dangers that continue to proliferate the closer she gets to presumably announcing her candidacy." Tony Rodham is the brother of Mrs Clinton who was appointed to the advisory board of VCS Mining, a Delaware-based company that has tried to raise money to mine for gold in Haiti. In March, the New York Times outlined the litany of complaints that many Haitians have about the Clintons. The article says that "Mrs Clinton’s brother Tony Rodham has turned up in business ventures on the island, setting off speculation about insider deals." In interviews with The Washington Post, both Rodham and the chief executive of Delaware-based VCS Mining said they were introduced at a meeting of the Clinton Global Initiative (CGI) — an offshoot of the Clinton Foundation. Asked whether he attends CGI meetings to explore business opportunities, Rodham said: "No, I go to see old friends. But you never know what can happen." The Washington Post article said that all sides deny that the Clintons had any role in Rodham’s appointment to the VCS advisory board. He said he has not been involved in any other deals through connections made at CGI. In another leaked email to Mr Podesta Budowsky asks if a column he wants to do about Elizabeth Warren would be 'a problem' for Hillary Clinton's campaign. "If you have a problem with my suggesting this as my idea, I won't tell anyone and I won't include it." Responding to a reddit post Mr Budowsky tweeted on Thursday: "Emails show Hillary has the media in her pocket, how is this a bad thing? Being favorable is always good!" Budowsky previously expressed concerns about Clinton Cash author Peter Schweizer’s partnership with the New York Times and other media outlets. In an April 2015 email to New York Times executive director of communications Danielle Rhoades he wrote: "My problem would be if the NYT has some sort of partnership, relationship, with such a hard-core partisan book that makes the NYT an effective agent of, or collaborator with, a partisan political operator or operation seeking to influence an election. "The places the NYT reputation and clout on the side of a partisan political project, as opposed to merely receiving an advance copy and then doing independent news stories." Meanwhile Wikileaks founder Julian Assange has promised that the email haul from Mr Podesta will provide “significant” insights into the current election campaign. In one thread of correspondence from August 2014 Ms Clinton sent an eight-point plan to Mr Podesta, at the time a counsellor to President Barack Obama, outlining a strategy on how to defeat terror group Isis which involved supporting Kurdish forces in Syria and Iraq with military advisers. The Obama administration ended up taking similar action to that described as desirable by Ms Clinton. The exchange also appears to show the presidential candidate identified the Gulf states of Saudi Arabia and Qatar as “clandestine” “financial and logistic” supporters of the terrorist group, despite surface cooperation between the US and the Sunni states on combating the militants and other actions in Syria’s multi-sided civil war. “While this military/para-military operation is moving forward, we need to use our diplomatic and more traditional intelligence assets to bring pressure on the governments of Qatar and Saudi Arabia, which are providing clandestine financial and logistic support to ISIL [Isis] and other radical Sunni groups in the region,” Ms Clinton reportedly wrote. The governments of both Saudi Arabia and Qatar deny deny arming Isis, although critics point out the terror group and the states share a common enemy in President Bashar al-Assad’s Alawite government. The states' respective embassies in London did not immediately respond to requests for comment. In the 2010 Wikileaks released cables signed by Hillary Clinton when she was US secretary of state that said that Saudi Arabia is the world's largest source of funds for Islamist militant groups but the Saudi government is reluctant to stem the flow of money. "More needs to be done since Saudi Arabia remains a critical financial support base for al-Qaida, the Taliban, LeT and other terrorist groups," Clinton wrote in the leaked 2009 memo. "Donors in Saudi Arabia constitute the most significant source of funding to Sunni terrorist groups worldwide." Analysts have speculated that the Podesta emails came from a recent leaks from the Democratic National Convention. Also revealed in the emails is correspondence between Mr Podesta and the former lead singer of US rock band Blink 182 about UFOs. Tom DeLonge emailed the senior advisor at least twice talking in cryptic terms about their shared - and well-documented - interest in the extraterrestrial. According to The Intercept, the Saudi regime has donated between $10 million and $25 million to the Clinton Foundation, with donations coming as late as 2014, as she prepared for her presidential run. The Clinton Foundation says that between $1 million and $5 million was also donated by “the State of Qatar,” the United Arab Emirates, and the government of Brunei. “The State of Kuwait” has donated between $5 million and $10 million.